In April ’15, my husband and I took a long anticipated trip to the low country, namely, Savannah and Charleston. 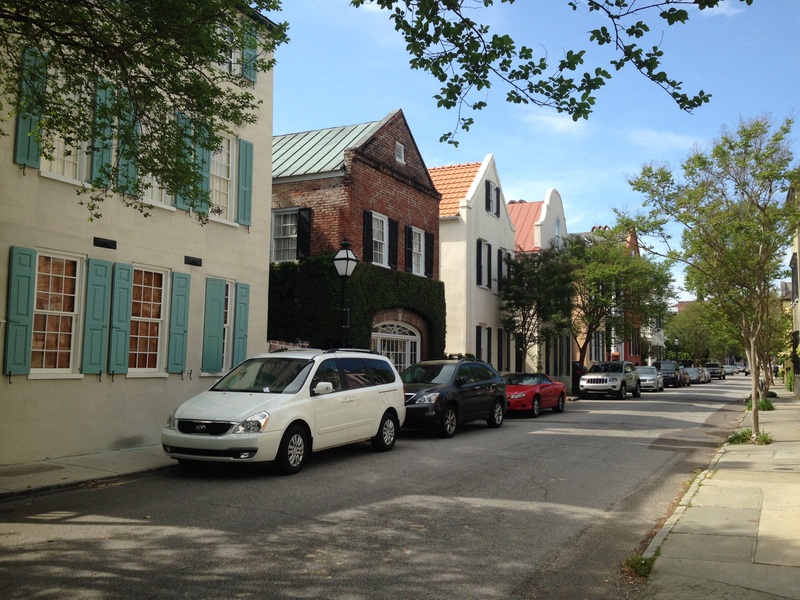 We started the trip in Savannah and later spent time in the beautiful town of Beaufort before reaching Charleston. It’s only two hours from Savannah to Charleston. I’d never been to this part of the country. I wanted to take in everything around me because it is very different from my world in South Orange County, California. 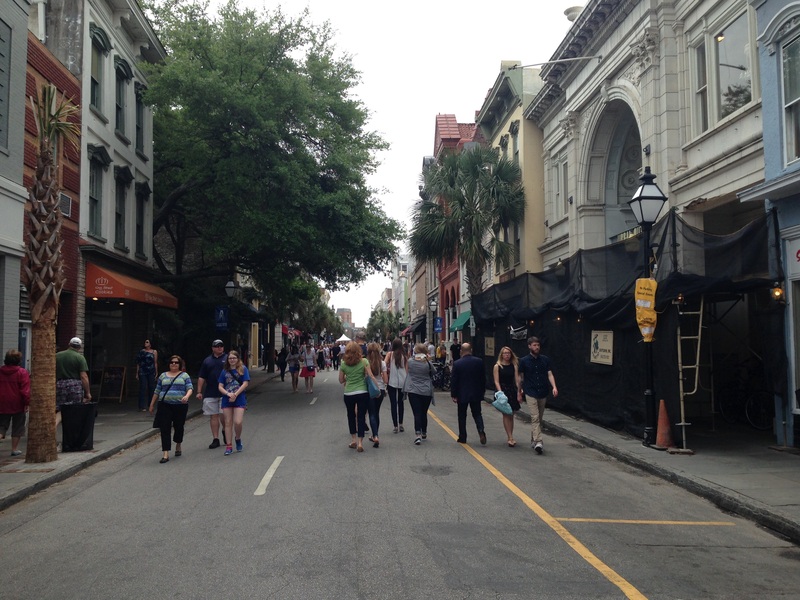 Why Savannah and Charleston? Although quite different from one another, they are both considered beautiful historic towns with distinctive low-country food. Both towns are very walkable. My favorite type of holidays are ones where I can explore everywhere on foot. Besides easy access to all the sights, you can walk off all the surplus food! When you get home, you would not have gained a pound….I’m serious. I walked and ate my way through many cities – Tokyo, Hanoi, Shanghai, Munich, etc. and actually lost weight! Both cities have a legacy of slavery. In fact, most of the African slaves brought to America came through the Port of Charleston. 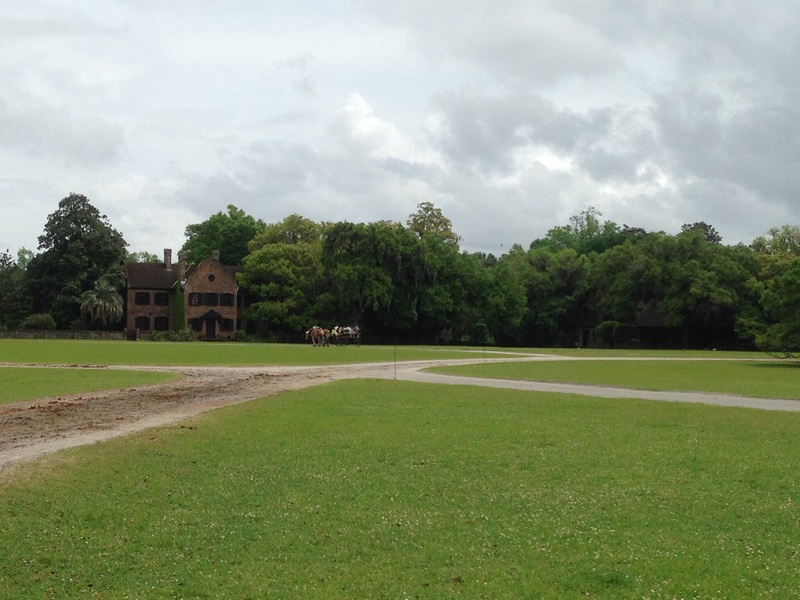 I wanted to see the plantations and townhouses which have preserved their original slave quarters. I’d read books about slavery in the Americas and real life slave narratives from the 1930s collected from the Works Progress Administration (these personal accounts are a must read for every American). Seeing some of the slave dwellings for myself made this country’s sad legacy of slavery so much more real. Finally, I wanted to experience real life Southern hospitality for myself. I am happy to say that Southern hospitality is alive and well. I was charmed by everyone’s genuine graciousness. We stayed in the historic section of Savannah. 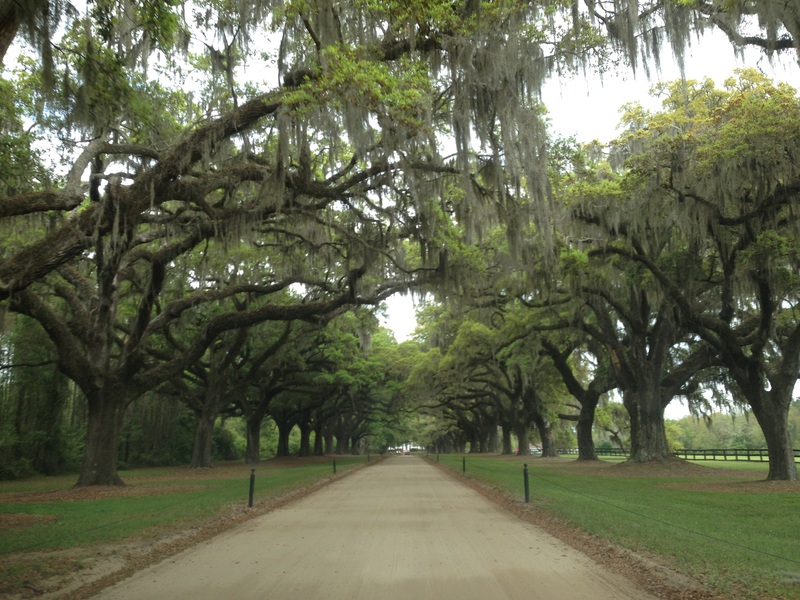 Once we drove in, I was immediately taken aback by the beauty of the large oaks and hanging Spanish moss. These trees are everywhere. Also plentiful are the beautiful squares (22 public squares in all) that are conducive to whiling away afternoons. Surrounding these squares are historic townhouses, mansions and churches, many of which were built before the Civil War. It’s a very romantic city to visit. The food in these parts is heavier than I’m used to. I did enjoy it (a lot) and tried all the low country specialties while I was there. So, while in Savannah, I had shrimp and creamy grits, fried chicken, fried green tomatoes, and some sort of pork with every meal! I tried collard greens for the first time, and I was in love. I grew up eating kale, swiss chard and spinach. While living in China, I ate a huge variety of greens, but never had I tried collard greens. When slow cooked, they retain their integrity and are slightly sweet. They slow-cooked them with pork fat….need I say more! I will definitely cook these for myself! A must go-to restaurant is The Olde Pink House. 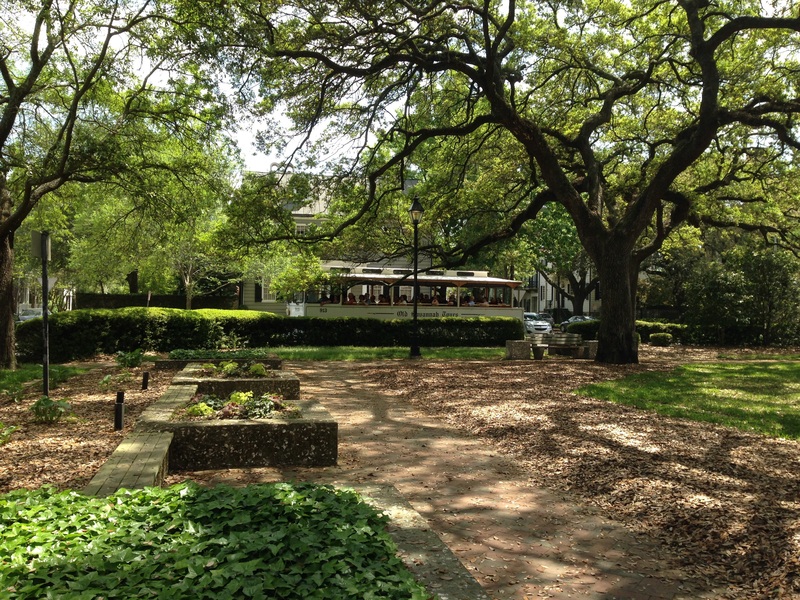 The restaurant takes up a beautiful old antebellum mansion and serves Southern specialties. The decor and atmosphere are charming. It’s very romantic, but you needn’t feel awkward when you’re just with friends. Matthew’s Eatery is a lovely place for brunch or lunch. I really loved their rendition of shrimp and grits. Gryphon Tea House was a great choice for sugary treats and high tea after a day of walking. On a hot days, they have wonderful mixed drinks with lemonade! 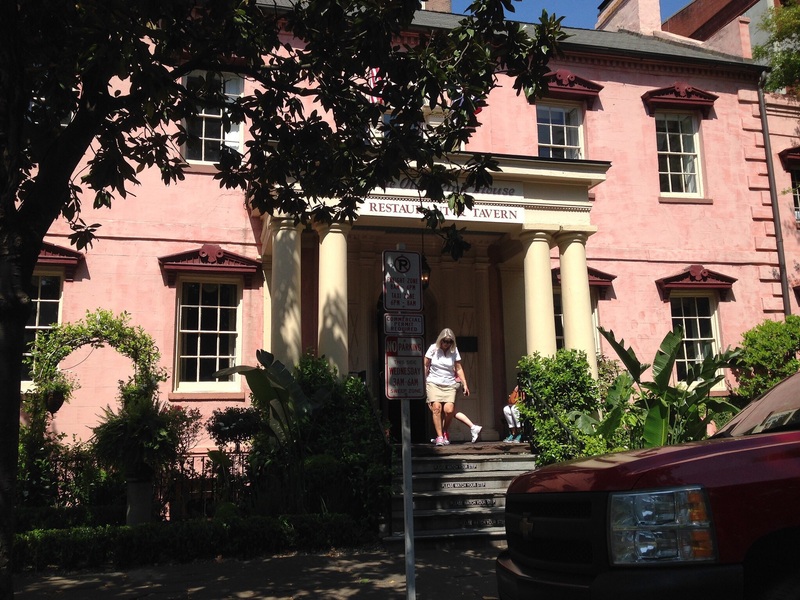 The place is run by SCAD (Savannah College of Art and Design). Its students work in the tea house and are very interesting to talk with. Goose Feathers Express Cafe and Bakery was the first place my husband and I went to in Savannah. We picked up the rental car at the airport and looked for a brunch place as soon as we got into town. Fortunately, we found this place right away. I had such a great time soaking in the atmosphere here. It was very retro. The place was buzzing, cheerful and perfect for breakfast/brunch. Their specialty is bread pudding. We only had three days in Savannah. We tried to go to Mrs. Wilke’s Dining Room, but the place is only open for lunch, and we missed the opportunity. This place serves Southern food around a communal table. 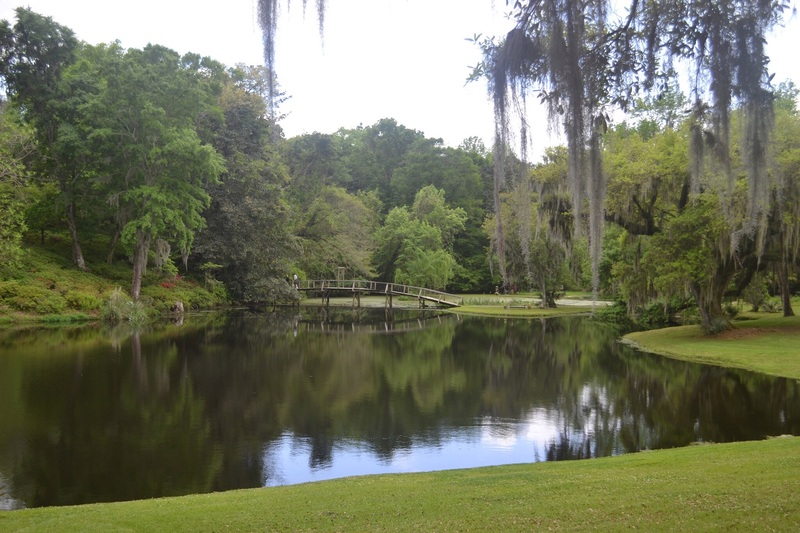 The other thing we didn’t get to was a picnic in one of the squares or even the famous Bonaventure Cemetery. We would have whiled away an afternoon sitting at a bench underneath one of those beautiful oak trees. A few days before heading to Savannah, I read the perfect companion novel, Midnight in the Garden of Good and Evil, by John Berendt. 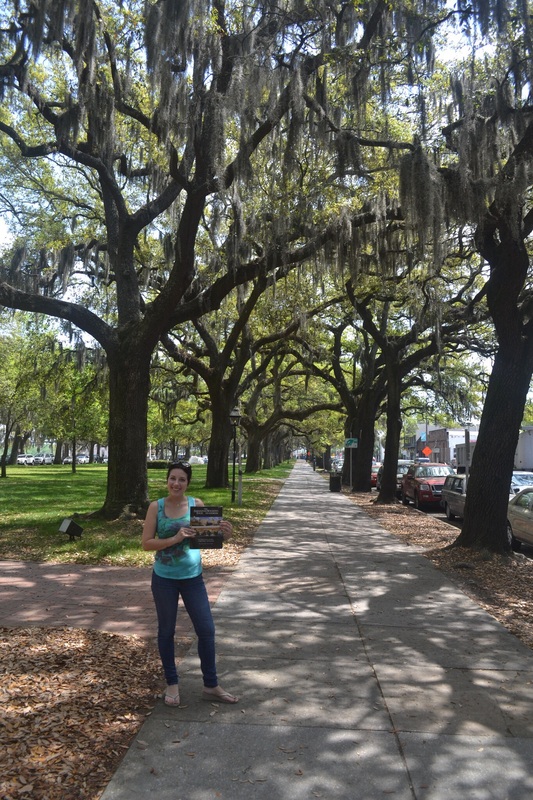 This book was published in the 90s and single-handedly put Savannah on the tourist map again. 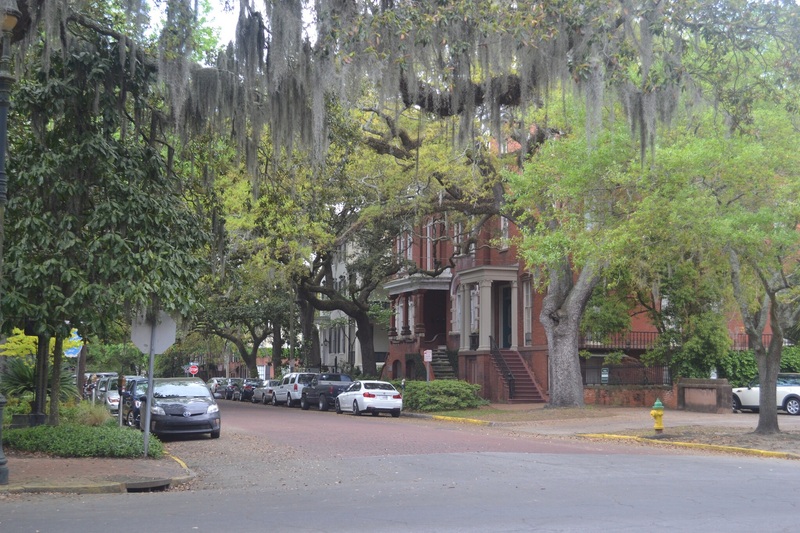 The novel (based on real events and real people) reads almost like a city guide-book to Savannah, except that guide books don’t have all those eccentric characters in them. 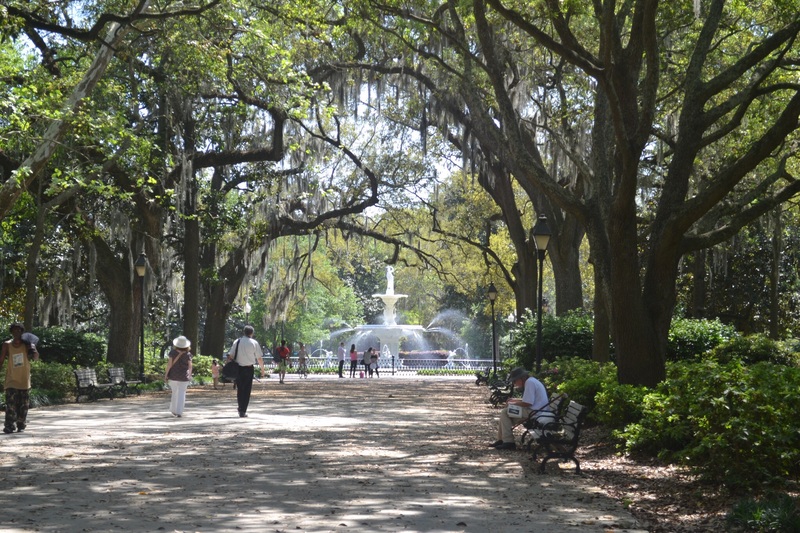 There are very popular “Midnight in the Garden of Good and Evil” city tours everywhere because the book has inspired so many to come to Savannah. I didn’t take any of these tours, but I did tour the beautiful and historic former home of Jim Williams, the main character in the book. It’s called the Mercer House. Anyway, I highly recommend reading this book if you plan on a trip to Savannah and even if you don’t. When we left Savannah, I was sorry to leave. I had grown attached to the place in such a short time. Not many places have held me by the heart like that. I told myself that I would certainly come back again and try to stay in one of those old townhouses. 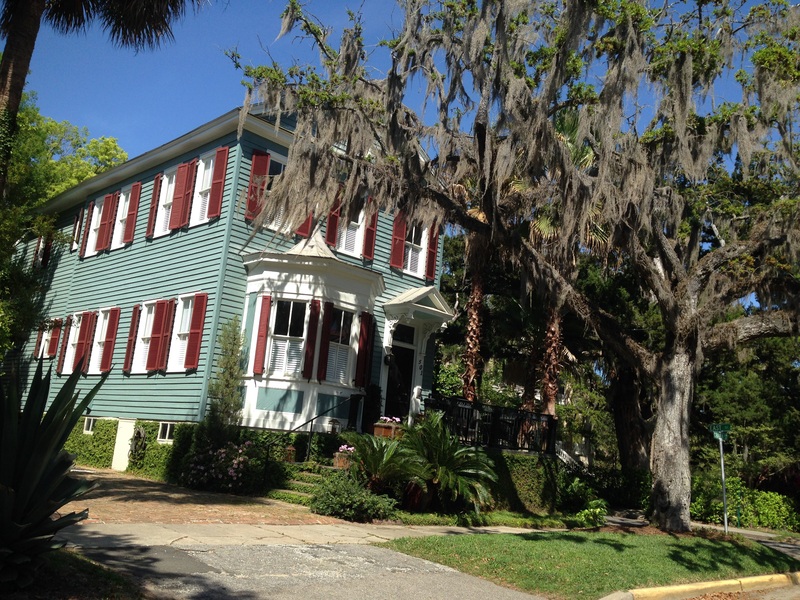 Beaufort is a little jewel of a town roughly half way to Charleston from Savannah. It made the perfect stop for lunch. I wasn’t expecting to find the town so charming. If I get the opportunity, I would love to one day return and spend more time here. The town has a lovely main street with many art galleries, shops and restaurants. Surrounding the main street are absolutely gorgeous historic mansions in the Italianate, neo classical, Victorian, and Queen Anne styles. 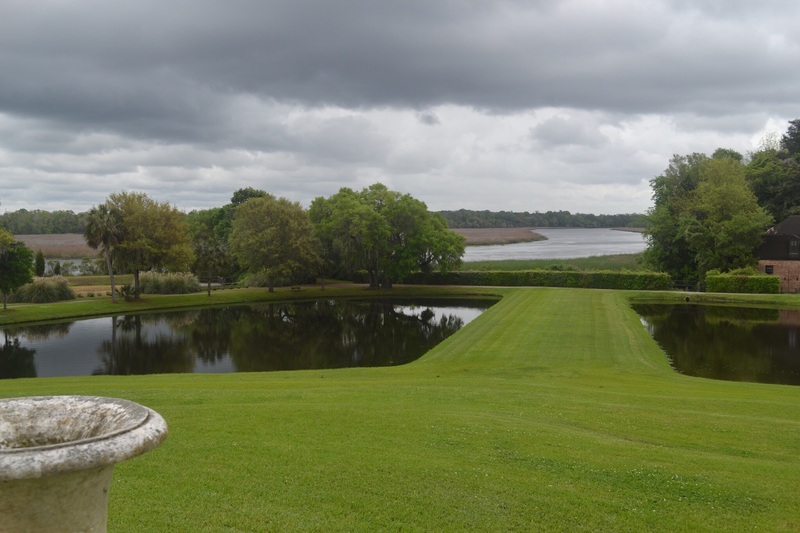 In recent years, Many people have decided to make Beaufort their home, and I can see why. 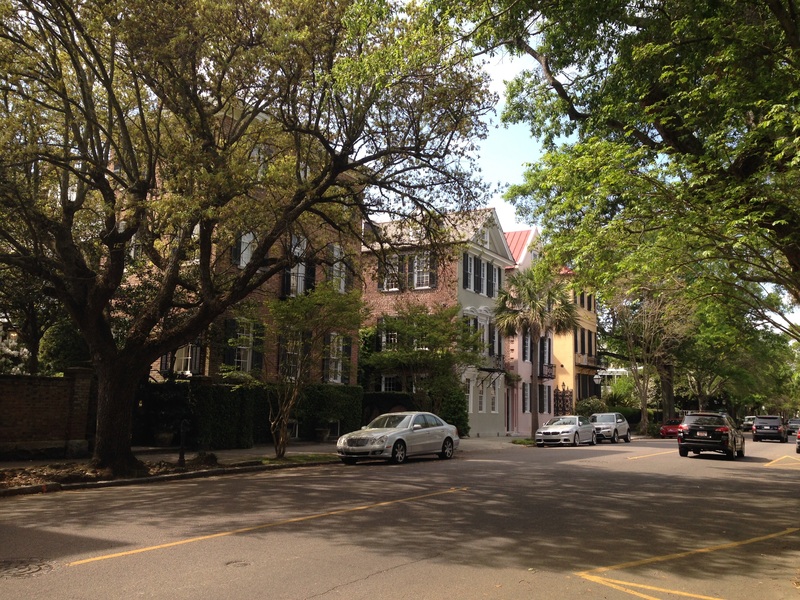 My husband and I drove around the quiet tree-lined streets and gawked at those beautiful homes. We popped into a few art galleries on Bay street and walked to the water front lined with outdoor cafes and restaurants. We had to make it to Charleston by early evening, so we had to leave. 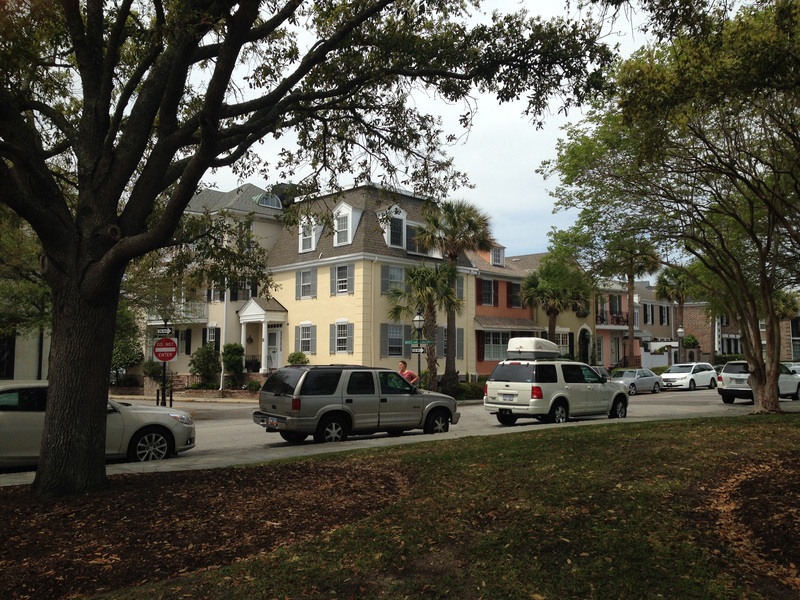 Charleston felt like a more cosmopolitan and sophisticated cousin of Savannah. The population was younger, as students from the University of Charleston, filled the town. It’s one of America’s best preserved historic cities. Many of the churches, townhouses and government buildings were built in the 18th and 19th centuries. There are an abundance of horse carriage tours to make one pretend they are in another time. 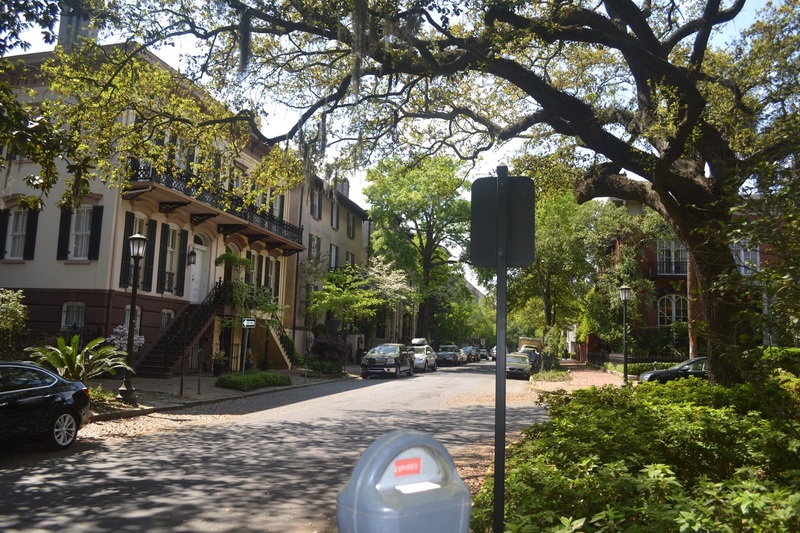 Tours around Charleston’s historic area are immensely popular. We had four full days to explore the city and the surrounding areas. 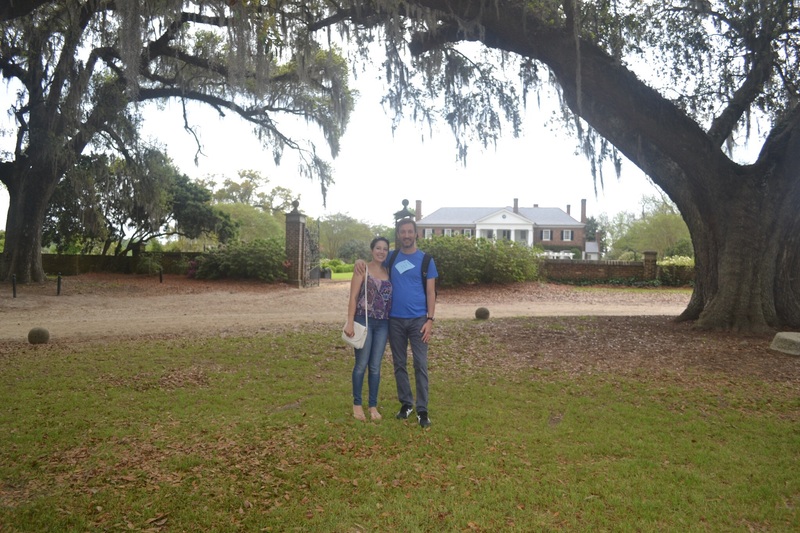 We spent two of those days visiting two plantations in the mornings and then walking around Charleston and having dinner there in the evenings. We spent another day at the beach on Sullivan’s Island first, and the rest of the day in Charleston walking about and having dinner. One of the four days was spent solely in Charleston touring historic homes, visiting art galleries, shopping, and eating. 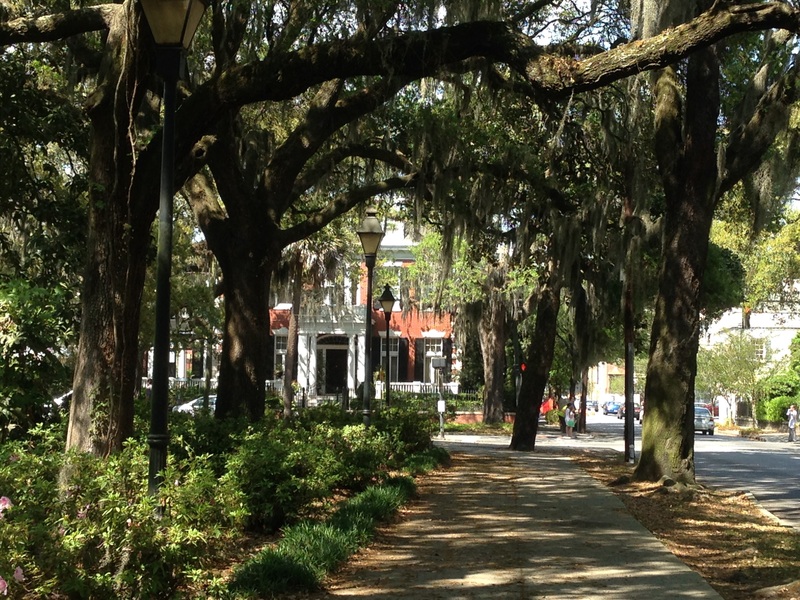 Charleston, like Savannah, is a very walkable city. We mainly spent time in the area south of Calhoun Street. We were lucky to be on King Street one Sunday when they closed off the road to car traffic. They do this every other Sunday, but if you ask me, they should permenantly close this street to car traffic. The atmosphere was great. The cafes and restaurants had their tables out on the street. I felt as if I were in Europe. It was great for people watching. South of Calhoun is the most picturesque and buzzing area of town. There are such an abundance of good dining options. The restaurants, especially during the peak seasons of Spring and Fall, fill up completely. Make sure to make reservations in advance. For the immensely popular restaurants like Fig and Husk, make reservations at least a week prior to visiting. There are bars galore in Charleston. The drinking culture here is alive and well. If you’re having to wait for a table at a restaurant, you usually can find a bar next door for pre-dinner drinks. 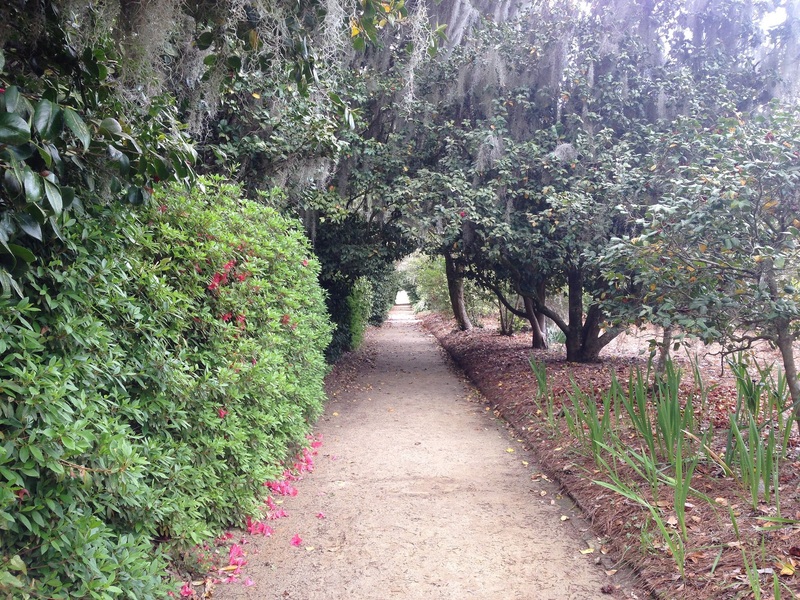 One day, we drove to Boone Hall Plantation, only 30 minutes outside of Charleston. 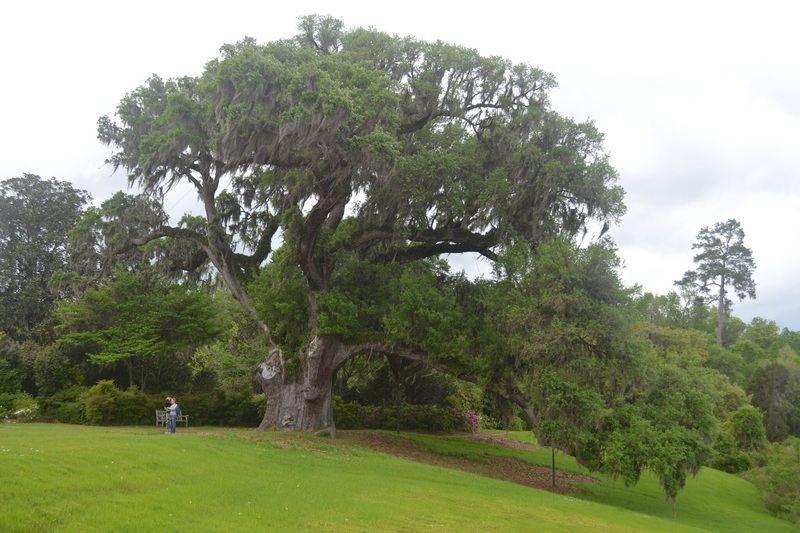 It’s famous for its spectacular entrance lined with live oak trees with hanging Spanish moss. We specifically wanted to visit this plantation because they still have nine of the original slaves quarters. The tours through those cabins are self-guided. We were recommended the Gullah educational performance. This is an absolute must. I was rivited from beginning to end. The performer was brilliant, (I wish I knew her name, it’s no where on the website) and she really touched me to the core. We took a tour of the main house, but it’s not the original antibellum house. 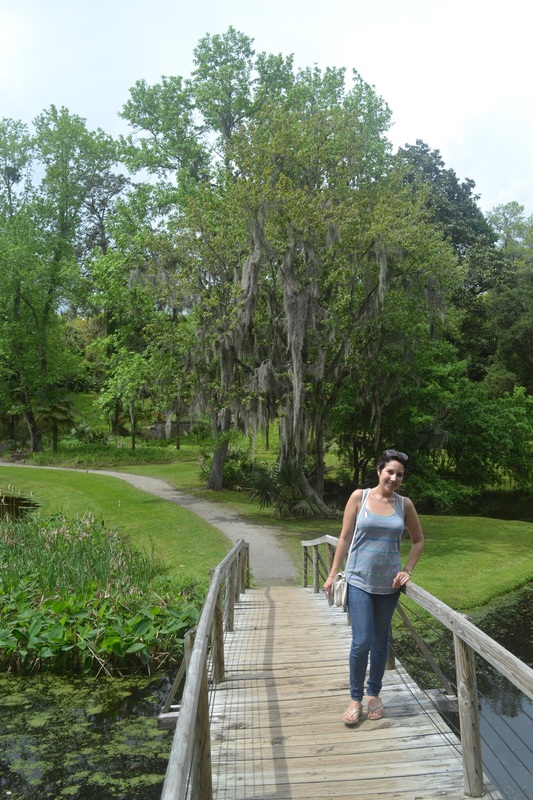 The other plantation we visited was Middleton Place, only 30 minutes away from Charleston. 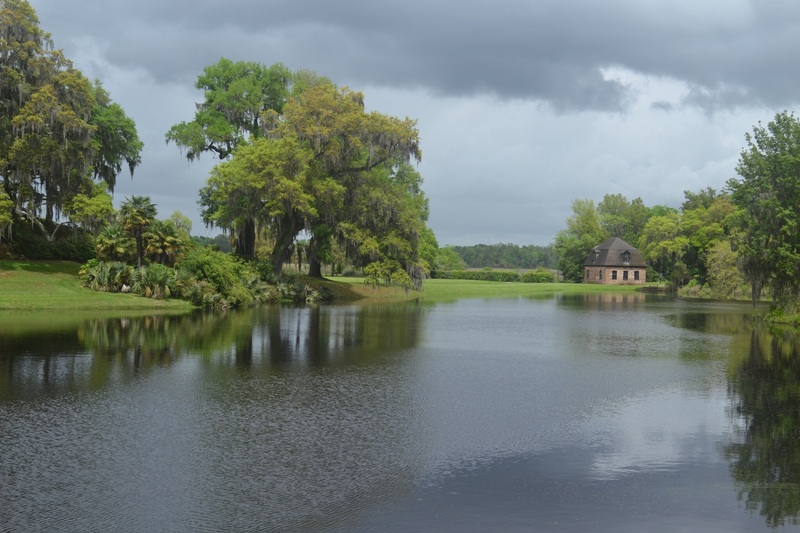 This is perhaps the most visited plantation and is most well known for its beautiful grounds. They truly are spectacular. If you go, make sure it’s a sunny day. Take sandwiches along for a picnic and a good book. My husband and I found a bench alongside an oaktree that was up to 1,000 years old……no kidding! It was the most serene place to relax and read. It’s also a wonderful place to walk around and get lost. Another day, we drove to Sullivan’s Island for some beach time and an early dinner at Obstinate Daughter. It was absolutely wonderful. The beach and the main street, lined with bars and restaurants, was all walking distance. 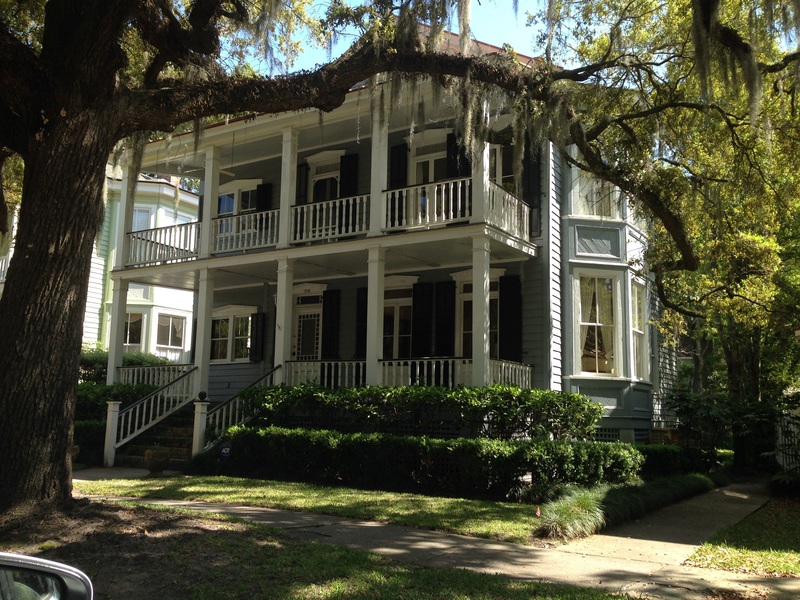 In Charleston, I toured a few historic homes. There are many to choose from, but I chose the Aiken-Rhett House and The Edmonston-Alston House. 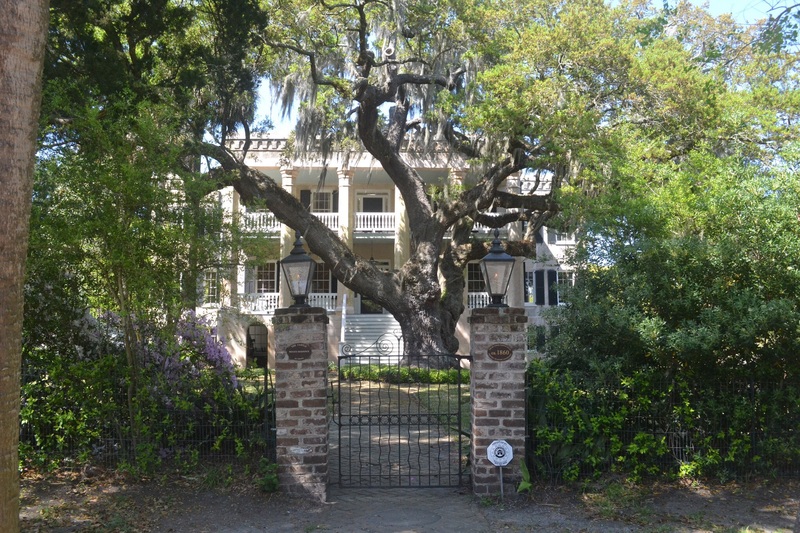 The Aiken-Rhett House was absolutely fasinating because the home is completely unchanged from the way it was during the Civil War era. It felt as if I was going back in time rather than being in a museum. The wallpaper was faded and peeling, but it was the original wallpaper! 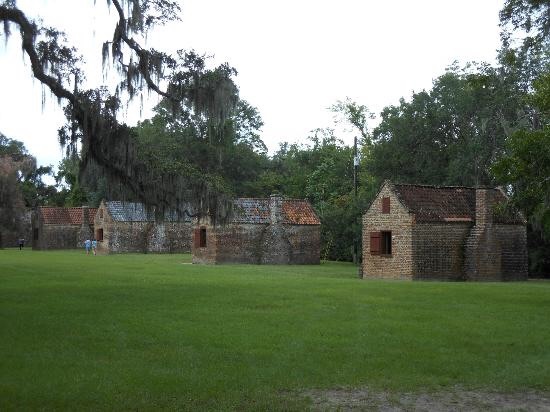 I specifically wanted to see the slave quarters and kitchen. There was a warming room that still contained the old dish warmer in the fireplace. The tour was self-guided, (with headphones) and you could take as long as you wanted to go through the house. 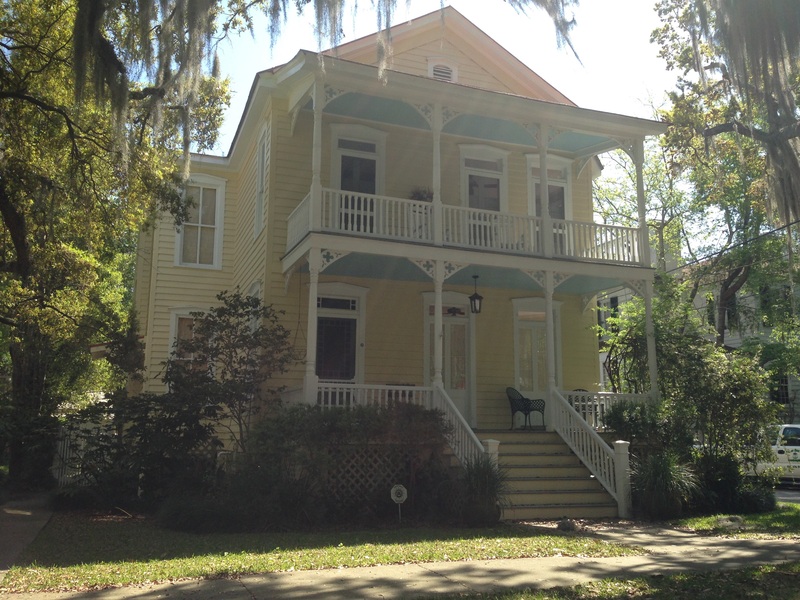 The Edmonston-Alston House was very different from the Aiken-Rhett House. The house was built in 1825, but has been owned by the Alston family since 1835 and beautifully maintained. The top floor of the home is still lived in and is off limits to tourists. The furnishings are teaming with gorgeous antiques and extravagant portraits of long gone family members. The library contains books from the 1700s and also original Civil War documents. Husk – Southern Food with a creative flare. The bar next door is great while waiting for a table. Obstinate daughter on Sullivan’s Island – delicious house-made pastas and pizzas, as well as other entrées. Jeni’s splendid Ice-cream – there are lines going outside the door for this ice-cream. After tasting it, I can easily see why. Their dark chocolate ice-cream was the best I’ve tried in the U.S.
Stars Roof-Top Bar – very popular restaurant, but I didn’t get to try the food. Instead, I enjoyed drinks on roof-top. This was a perfect one-week trip for my husband and I. I can’t wait to bring my children back with me next time.